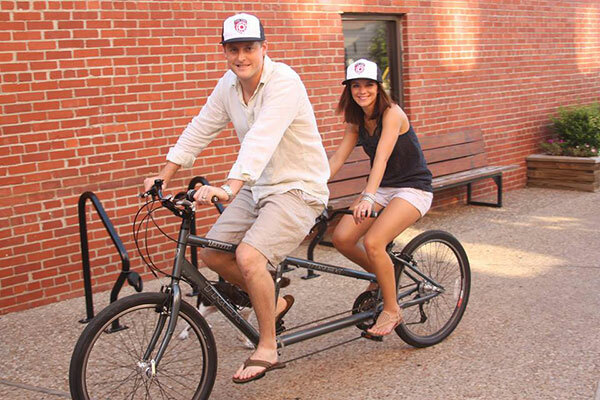 City Councilman Tim Robinson and his wife test out a Trek tandem outside of his bike shop, Phat Tire. Bentonville, Arkansas is probably most famous for being the headquarters of the global megastore, Walmart. However, that’s not the only name that Bentonville is making for itself. The other is in bicycling. The International Mountain Bicycling Association (IMBA) named Bentonville a Silver-level Ride Center for its paved trails, shared lanes and 25 miles of urban singletrack. Bentonville’s move toward embracing bicycling didn’t start until 2006, but City Councilman Tim Robinson has been there since the beginning. Councilman Robinson is a busy man. He manages the baking business for Walmart U.S., owns a small chain of bicycle shops and was recently elected to Bentonville’s City Council. Somehow, he finds the time to get out and ride and be an active bicycle advocate, making his community a friendlier place to live and ride. PeopleForBikes: How has the creation of bicycle-friendly infrastructure changed the local economy? Councilman Robinson: I moved here when I was in junior high school. At the time, Bentonville had 15,000 people and no trails at all. If you wanted to go do outdoors stuff, you had to drive an hour outside of town. That’s just really hard for people. Now, the town has three or four bike shops and 25 miles of singletrack. We have more than 20 miles of paved trails and probably close to 20 miles of share the road signage. When you’re driving around town, you see groups of people riding with smiles on their faces, getting ready to go on a ride or coming back from one. It’s really amazing. What kinds of actions would you like to see taken at the state level to support bicycle projects and initiatives? More than anything, I think leveraging best practices is very important. If I were at the state level, I would ask, “How can I try to leverage and scale programs to make it easy for more communities to tap into resources?” The other thing that is a challenge for every community that wants to be more bicycle-friendly is educating riders and drivers on rules and right-of-way. One piece we’ve been really successful with is getting more kids into biking. Bentonville bought 550 bikes a year-and-a-half ago for the school system. Every school has a physical education program about bicycle safety that includes lessons in how to ride and how to go out and enjoy mountain biking. The high school even has a bike shop where students get credit for learning technical skills and how to run a small business. They work at this bike shop fixing and repairing all of the school’s bikes. It’s a vertically integrated bicycle program within our school system. Mountain bikers in Arkansas enjoy four seasons of riding. 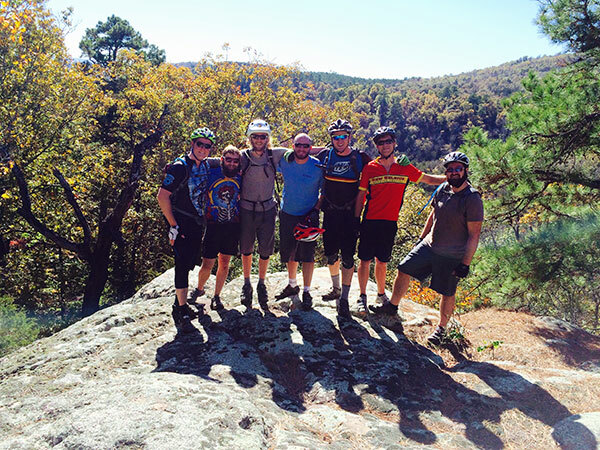 Here, Councilman Robinson and friends get out in the singletrack around Bentonville to enjoy a sunny fall day. Did being a rider and bicycle shop owner influence your decision to run for office? Ultimately, I think it did. There is a non-profit organization called Downtown Bentonville, Inc., and they focus specifically on entertainment, economic development, recruiting restaurants and small businesses. Because I had a small business, they asked me to be on the board of directors to help make downtown more active. I didn’t know it at the time, but that was my first taste of getting involved and working with the mayor and city to be really civic-minded. I’ve now served the max tenure I can for that downtown board, but why not take my experience from downtown and apply it to the broader community? As a member of the City Council, what will you do to improve, expand and support bicycling in the Bentonville community? I really want to make sure I understand the financial part of it, how much can go in and out of the parks and recreation budget and how much funds go to continued trail development and maintenance. That said, one of the things that has been up-and-coming in the U.S. is bike sharing programs. Through Walmart, we were able to launch a bike sharing program just for Wal-Mart Associates. We got 80 bikes for the Walmart campuses around Bentonville. They’re not available to the public yet, as we wanted to test it. I really do feel that now that the broader community is supportive, it may be something we should consider opening to the public at large. We have the trails for people to ride safely and the community knows to watch for cyclists on the roads. That’s something that I’d love to work with our city’s Parks Director on in the next few years. The Bentonville Convention and Visitor Bureau has designated bicycle tourism as an important focus for the City. What is your go-to route when riding with out-of-town guests? Definitely the Slaughter Pen trail. That’s the trail that goes right up to my house, the trail that I helped walk the land for and helped build. Some of my friends were more involved in it, but I helped them on the weekends when I was home from Walmart. That’s what got this whole thing started. 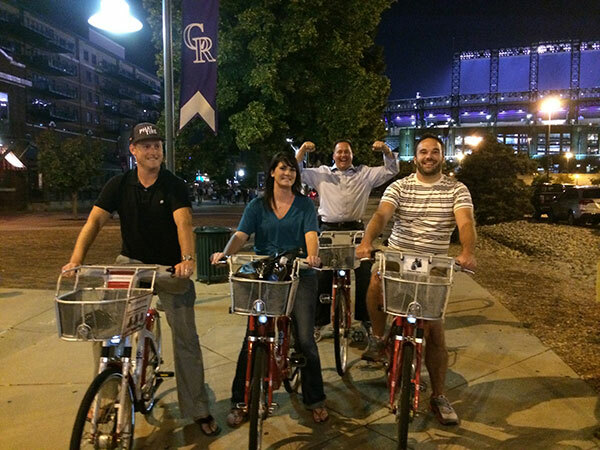 Councilman Robinson and friends test out Denver’s B-cycle bikes after a Rockies game.